My lovely mum came to visit me for the night on Tuesday and took me out for dinner to a wonderful fish and chip restaurant in Nottingham. If like I did, you think that fish and chips should really just be from a local takeaway that you know and love, this restaurant will prove you wrong. From the minute you step into the building and right up until you walk out, there is a seaside-y feel to the whole place and it kind of feels like you are chilling at the beach. Some tables have even been made into private indoor beach huts which were so cute although they were for bigger parties so mum and I didn’t get to sit in one! We were very happy with our little table by the window though which looked out onto the main square in Nottingham city centre. I honestly couldn’t fault a thing at this restaurant, the main course, desert and cocktails were all delicious. What really made the meal were the quirky extras that I have never seen in any other restaurant. For example, the menus were made to look like old fashioned newspapers that you would eat fish and chips from, we were able to order a side of bread and butter ‘to make chip butties with’ and even mum’s English tea was served with a little sand timer that was supposed to show you the perfect amount of time that a pot of tea should brew for. We loved it all, especially the sharing desert that was definitely inspired by seaside piers with fresh sugared donuts, candyfloss and icecream with chocolate flakes. Anyone local to Nottingham must try it out, I want to take all my friends who come to visit now! The staff are lovely and make you feel very well looked after and they even do a 10% student discount (although I forgot about it, doh). A must do for any foodie in Nottingham! I am very lucky to receive lots of freebie products now that I work for Boots. Most of these items are usually health or beauty related so it was a real treat to have a huge ice cream delivery to work this week. Obviously a lot of Boots stores stock food and a supplier sent literally hundreds of ice cream samples to our food team on a particularly hot day last week. You have never seen anything like it, I swear all adults turn into children when there is free stuff on offer – especially copious amounts of ice creams that have to be eaten before they melt. 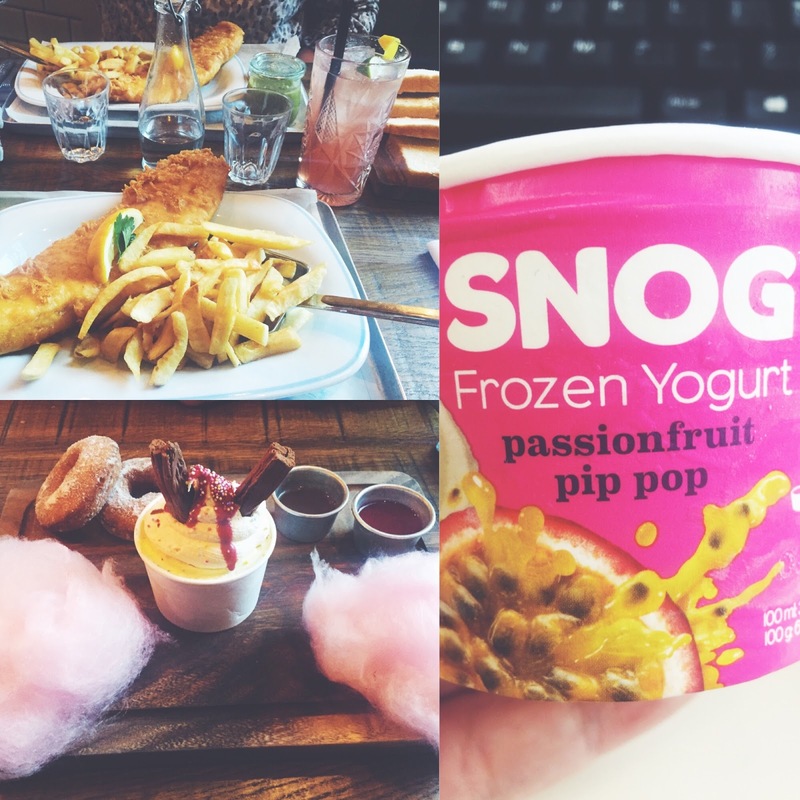 I have a friend on the food team and I don’t think I have ever been more popular among my colleagues than on that day when I returned back to my desk with a full box of Snog frozen yoghurts for the team. I am going to miss these perks of the working world when my placement finishes! Yes you guys! I have been getting lots of lovely comments on my posts recently and it honestly makes my day whenever I read one. I make sure that I reply to every single comment as I really appreciate how you guys take a little bit of time out of your day to write to me. So I have a question for you, what has been your favourite thing this week? I hope it has been a good one!